Soups are the nutritious food supplement. Most soups contain food particles in liquid forms with slight small pieces of other food ingredients. There are many different types of chicken soup. Here I described 3 different chicken soup recipes. Those are chicken soup with soya ball, chicken soup with corn, and chicken soup with vegetable. Soya Balls soup adds soya nuggets, which is basically a dried form of soya vegetables, containing high caloric food substance. 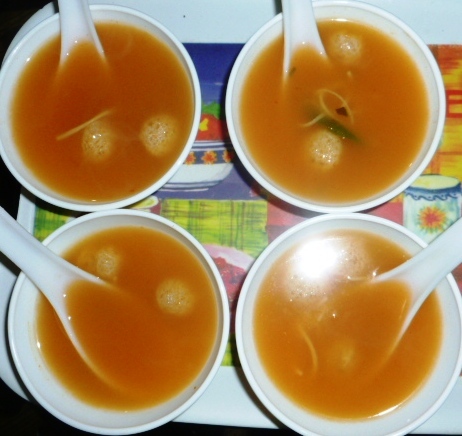 It is also a very tasty soup with soupy noodles, which you can serve as a snack, especially in the afternoon. It is liked by most of the children. The soup gives better flavor and taste while served as hot. Cooking of Soya ball soup needs frying nuggets and boiling both nuggets and soup. Then it is just mixing of the chicken stock with all other ingredients. Fry soya balls/nuggets for 1-2 minutes. Boil in hot water for 5 minutes. Then boil noodles for 5 minutes. On a separate deep pan, mix chicken stock with all other ingredients. Cook over medium heat and stir continuously till your desired thickness is reached. Take out of the pan and serve soya ball soup in soup bowls. Boil water in a pan and stir chicken pieces in the boiling water for 5 minutes to melt away the clinging fat. Drain out the fatty water and then keep aside. Add butter, chopped onions, and flour. Stir and add the liquefied tomato, chicken pieces, celery, salt, garlic paste, ginger paste, beans, carrots, chopped potato, and corn. Add six cups of water and cook on medium heat. Cover with a lid and stir frequently. When the chicken and the vegetables are cooked, add the previously cooked macaroni and black pepper and stir slightly. Chicken macaroni soup is ready to serve. Fry the chicken pieces with butter, ginger paste, garlic paste, and ½ tsp salt. Keep it aside. Boil chicken stock and after 2 minutes add chicken pieces, baby corn, and corn flour mixed with water. Add egg into the soup and again stir constantly. After 2 minutes add green chilies, black pepper, lemon juice and remaining salt. Take out of the burner and put in a large serving dish. 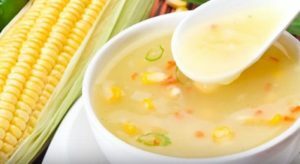 Chicken soup recipes with corn are ready to serve. Serve the hot chicken corn soup with tomato sauce, chili water, and pepper as per individual’s choice. 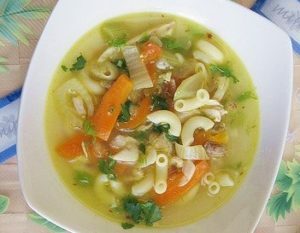 If you like my chicken soup recipes please share the recipe with your family and friends.